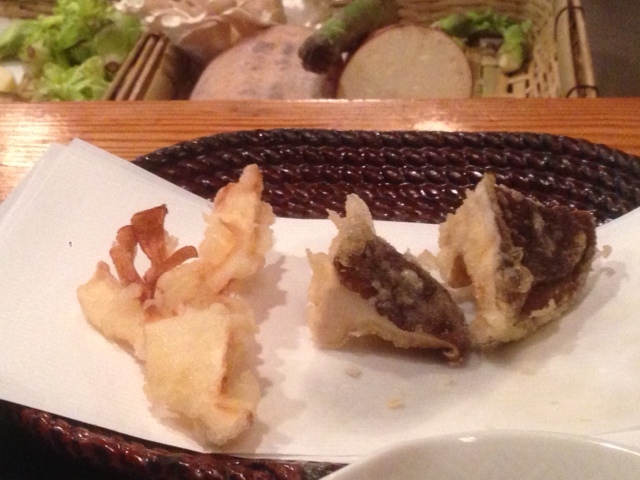 After a morning of some much needed rest, it was tempura time. Kyoto likes to claim that it is the creator of tempura and while I’m not sure about that, it’s clear that they take tempura very seriously. It’s also way more expensive than what one gets normally gets in the States. With that in mind, I decided the best way to enjoy a tempura feast on a semi-reasonable budget was to opt for the lunch version. Chris had already secured us 2 passes for the Imperial Palace later that day so I picked a restaurant within walking distance, which has had great reviews. Tucked on a quiet side street, the chef Tempura Yoshikawa has been perfecting his take on tempura for decades. There was counter seating surrounding the chef, and we lucked out getting the last two seats. 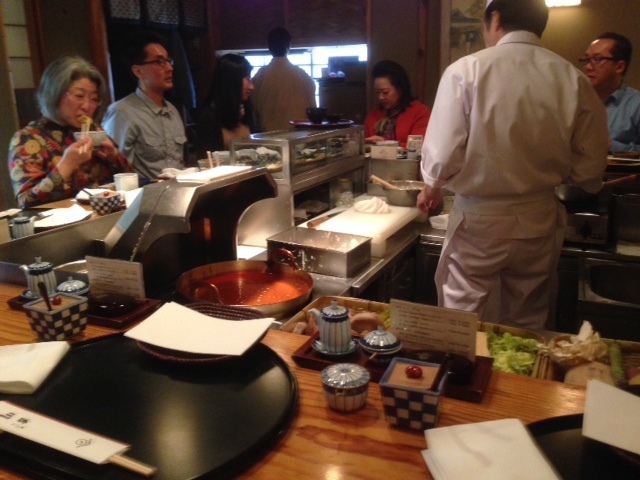 The menu was omikase style, with 10 total items chosen by the chef. 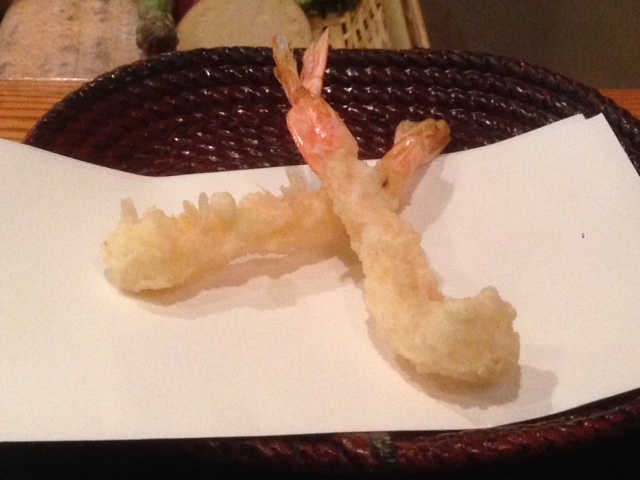 Not surprisingly, we started off with the classic shrimp tempura, which was light and delicious. Our server suggested we use the dipping sauce and while I normally I turn that down, I figured this was the best chance to have a really good one. 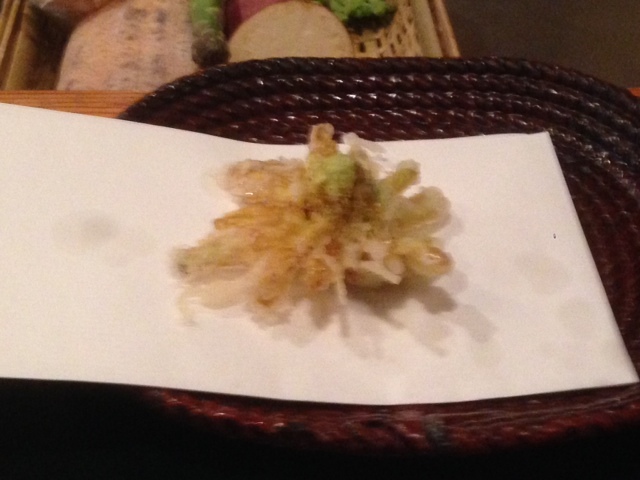 It that was a good choice as it added a nice other dimension to the already delicious tempura. 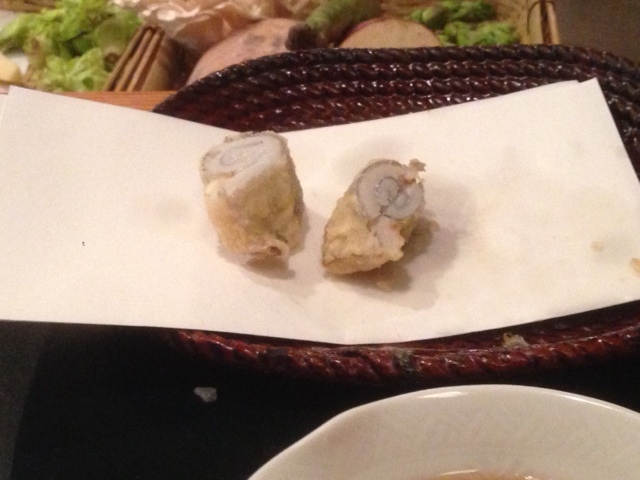 White fish, which came with a really good smoked salt. But the final 2 were by far my favorite. A large, meaty chunk of shiittake musroom and a stunning white mushroom. Delicious. 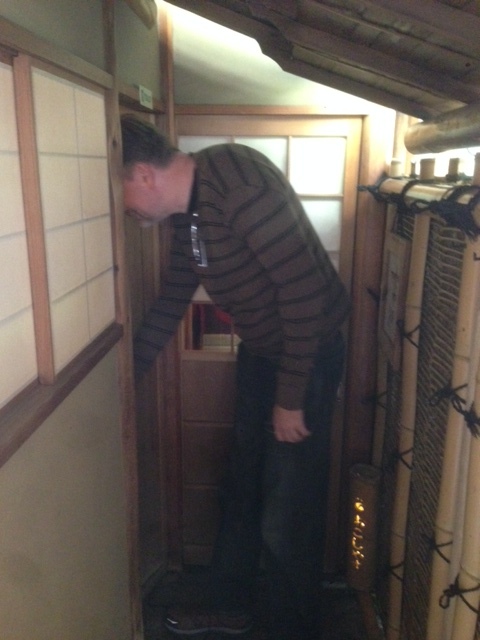 And yes, there was another case of Steve trying to fit into a Japanese sized thing – this time their bathroom. After indulging in all of that tempura goodness, we made the hike up to the Imperial Palace. The grounds to the palace included a massive park which was filled with cherry trees in full bloom. The sunny and slightly warmer weather made the somewhat long walk to the entrance enjoyable. This soon turned to something less than that as we were shown into a large orientation room filled with tourists of all nationalities. Yes, I was about to do my least favorite thing while on vacation – a guided tour. Since Chris had been nice enough to get the tickets plus he had endured my tempura obsession, I gritted my teeth and rolled with the tour. Again, the almost perfect weather helped and at least some of the tour was fairly interesting. I found the portion in front of where the Emperor would receive visitors particularly enlightening. Still, after an hour of slowly trudging from spot to spot, avoiding the mass of people trying to take photos of pretty much everything. I was done. Fortunately, Chris was as well. We headed back to our machiya for a quick nap and prepared for the night fun ahead.